Tattoo bundle unearthed in Williamson County, Tennessee (Aaron Deter-Wolf and Tanya M. Peres). The world's oldest tattoo kit was discovered in Tennessee in 1985. It contained sharpened turkey bones and mussel shells with traces of red pigment. It’s estimated the kit was buried at least 3,600 years ago in a Late Archaic cemetery. At the time of discovery, archeologist didn’t know the bundle, wrapped in animal skin, had anything to do with tattoo art. So the kit was boxed up and placed on a shelf in a presumably dusty and dank corner, for two decades. But that all changed in 2007 when along came the research duo of Tennessee-based archaeologist Aaron Deter-Wolf and Florida State University zooarchaeologist Tanya Peres. (Zooarchaeology is the study of faunal remains.) After revisiting the artifacts, the pair recognized them as a sacred bundle used in indigenous rituals. In this case, the kit was soon suspected to be a tattoo bundle. The sharp bones recalled needles, while pigment residue on the shells suggested that they were used as ancient inkpots. 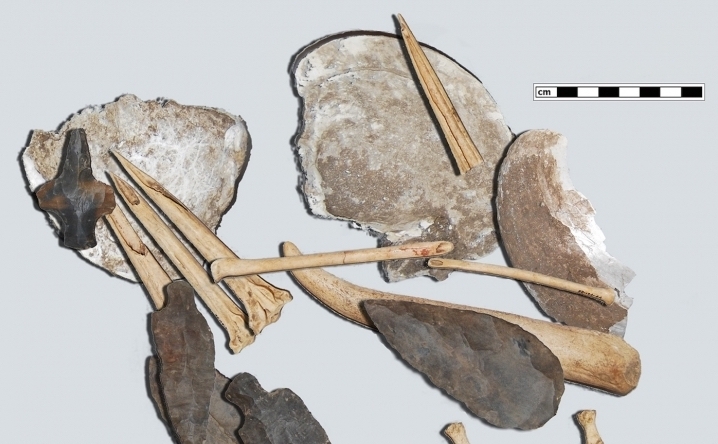 Other turkey bones that were stained appeared to be tools for mixing pigment. The whole assortment had been placed in the grave beside its occupant, suggesting that it held significant value for that individual. From 2007, when Deter-Wolf and Peres first took the tattoo kit from its dusty shelf of two decades, until earlier this month when the two presented their latest research at the Society for American Archaeology’s 83rd Annual Meeting, the research involved laborious testing to concretely identify the tools. After carbon dating testing was performed on the kit and once any potential offset in years was factored in, the team dated the tattoo kit's origin back to somewhere between 1,600 BCE and 3,200 BCE. That would make the toolkit 600 years older than ancient obsidian pieces that were directly identified as tattooing implements in 2016. The tattoo kit was originally found during a bridge replacement job in Williamson County, Tenneesee. The bridge is built on a site known as Fernvale, a Native American settlement.